Is it really Rev. Al Sharpton against the teleprompter or is it that he just can’t read? From the Washington Free Beacon comes the following best of All Sharpton struggling with the English language. Exactly how does this man have a show on MSNBC? I am not sure which one is my favorite, President Obama holding a “Kolique,” Everybody Loves Ray “Morahno,” “accidental asphema,” or the the massive “manhood” going on in Paris. But perhaps the best is the “use tube” celebrities that Obama met with just just week. ARE YOU SERIOUS? YOU MEAN REV. AL IS NOT EMBARRASSED JUST A LITTLE? Just in case you might have missed the previous Al Sharpton vs. the Teleprompter videos, the following are for your viewing entertainment and I mean entertainment. The parent network, NBC, must be so proud. David Brinkley, Chet Huntley, John Chancellor, Garrick Utley and Tim Russert are all collectively rolling over in their graves. Did VP Joe Biden just make the gaffe or all gaffes that could cost so-called Independent Greg Orman the Kansas Senate election? During an interview today with Connecticut radio station WPLR, Joe Biden made a remark that many “Jay Hawk” voters better take notice of before they cast their vote today. Biden was asked whether he thought the Democrats would retain control of the US Senate and what key battleground states are important to Democrats.Biden said, “We have a chance of picking up an independent who will be with us in the state of Kansas.” REALLY? Hey Kansas voters, Biden is referring to the so-called Independent Greg Orman. Hmm … Biden already knows that Orman is going to caucus with them … THAT HARDLY SEEMS INDEPENDENT NOW, DOES IT! WAKE UP KANSAS AND VOTE FOR PAT ROBERTS!!! Vice President Joe Biden blew Kansas independent Greg Orman’s cover in a radio interview today. Orman hasn’t stated which party he’ll caucus with in the Senate–actively avoiding announcing whether he’ll be with Republicans or Democrats–but Biden stated definitively that Orman “will be with us” if he’s elected. “We have a chance of picking up an independent who will be with us in the state of Kansas,” said Biden, as he predicted the outcomes of various Senate races around the country. Orman has stated that he’ll caucus with whichever party holds the balance of power in Kansas, but Republicans have long suspected he’s likely to join the Democrats’ side. Biden seemed to confirm that belief in this interview. Given the lengths to which Democratic groups have gone to stealthily support Orman’s candidacy, Republicans who turn out to vote Orman are likely doing so at this point out of an all-consuming hatred for the unpopular incumbent, Sen. Pat Roberts (R-KS). That’s forgivable, but it is not particularly rational – particularly if those Republican voters also hope to relegate Sen. Harry Reid (D-NV) to the minority in the 115th Congress. Who needs Jim Carrey and Jeff Daniels from ‘Dumb & Dumber’ when we have Joe Biden who can handle both roles … Hey, Joe, who is doing the real war on woman? Leave it to Joe Biden to praise a former US Senator, who had to resign in disgrace amid accusations that he had sexually harassed numerous woman over decades, at of all things a conference on woman’s issues. Way to go Joe. It is just hard to believe that this man is a heartbeat away from the presidency. Maybe that is why no one impeaches Obama, we would get crazy Joe instead. At a woman’s issues conference on Friday, Vice President Joe Biden praised former GOP Senator Bob Packwood as a different type of Republican who was willing to reach across the aisle. Biden fondly, or is in fondle, reminisced of the days of yore about Bob Packwood. RUT-ROH. However, that is not the only thing that Packwood was willing to reach for. Biden says, “this is not your father’s Republican party. I’m not making a moral judgement.” LOL, maybe he should have. Truth be known, The Republican party of today is more like your father’s Democrat party. As for today’s Democrats, this is not your father’s Democrat party of Harry S. Truman and John F. Kennedy, this party has lurched so far Left, they have become socialists. Vice President Joe Biden stumbled again Friday. Speaking at a Democratic event devoted to women’s issues, Mr. Biden made a favorable reference to former Sen. Bob Packwood, an Oregon Republican who resigned in 1995 amid accusations that he had sexually harassed women over a period of decades. Mr. Biden mentioned Mr. Packwood — and also the late Maryland Republican Sen. Mac Mathias – as examples of GOP lawmakers willing to work across the aisle and support progressive legislation. Would you expect anything less when taking advice from a crack smoking, alcoholic individual? 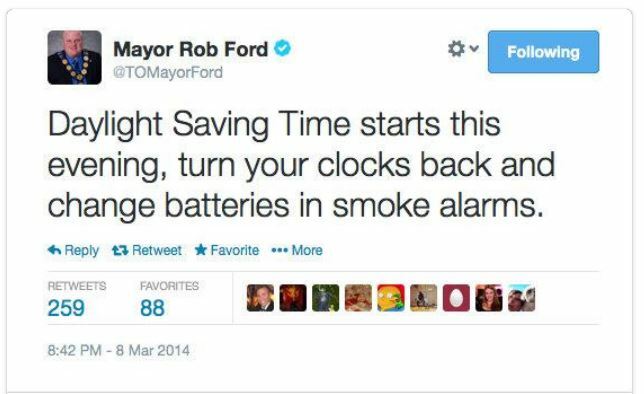 Toronto Mayor Rob Ford was at it again last night giving advice out to folks for the change to daylight savings time. Do you notice the problem from the tweet below? A note to Rob Ford, it’s “Spring forward, Fall back”. The crack smoking mayor instead told folks to turn their clocks back the wrong direction last night, Oops! Well, he had a 50-50 chance of getting it right. Needless to say the Twitter universe fired back mocking Rob Ford. At least he got the change batteries in smoke alarms right. Why do the feeling that Rob Ford would make a great segment for a DISHTV commercial … ” … Don’t take advice from a crack smoking mayor “. The comical part of this, beyond the obvious, is that this tweet blunder comes day after mayor’s social media manager resigns from job. Among his duties, it turned out, was providing information that was served up through social media on the @TOMayorFord account — which the mayor himself has obviously never contributed directly to. The incorrect tweet was eventually scrubbed from the account and replaced with a new, more accurate one.